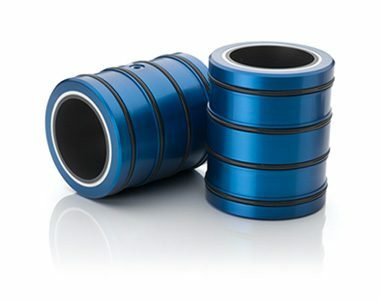 New Way® Air Bushings are ideal for rotary or linear shaft-based applications and are most often found where precision motion is required concurrently. Offered as an alternative to ball bearings, New Way Air Bushings remove friction through the use of our foundational Porous Media TechnologyTM. Air bushings distribute air through a ‘tube’ of porous media containing millions of sub-micron holes. The natural permeability of the porous carbon provides an even distribution of a thin, but a stiff layer of air. The design elicits a self-centering force allowing a full 360°non-contact motion on round shafts. Retrofits with ball bearings are easily achieved by coupling the air bushing with a pillow block housing unit. Co-polymer O-rings are provided for ease of installation into the pillow block to compensate for parallelism errors of up to .002″ over the length of the shaft. Available in standard metric and imperial sizes, air bushings are designed to fit commonly-available shaft sizes. Need a custom size? Contact us to tell us more about your application! Looking to constrain one end axially? New Way also offers a thrust bushing as a natural extension of the air bushing. 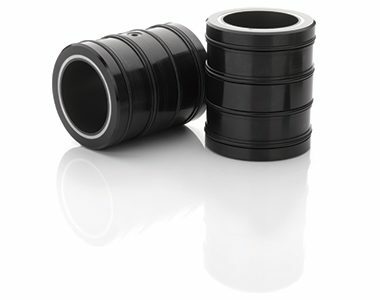 Available in standard metric and imperial sizes, air bushings are designed to fit commonly-available shaft sizes. Custom sizes are also available. With friction removed, New Way Air Bushings offer a number of operational efficiencies available across industries. Several example industries and the benefits they are seeing are listed here. Feel free to contact us today directly for use in your application! Contact us for a complimentary consultation for using air bushings in an existing or new application!